When the temps drop the girls love nothing more than staying indoors in their jammies, with some hot chocolate, popcorn and a movie. Who could blame them? Out of everything I have ever made them the handmade pajamas and nightgowns get the most wear. 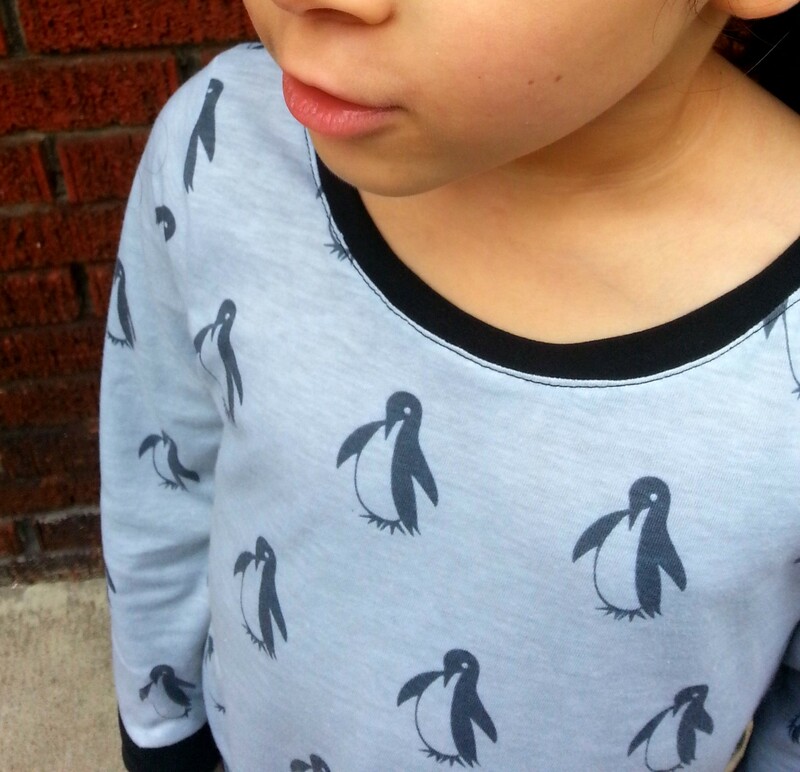 The dresses and tops I make them don’t always make the cut when getting dressed for school (so sad), but the cozy flannel nightgowns and waffle knit pj’s get chosen again and again. 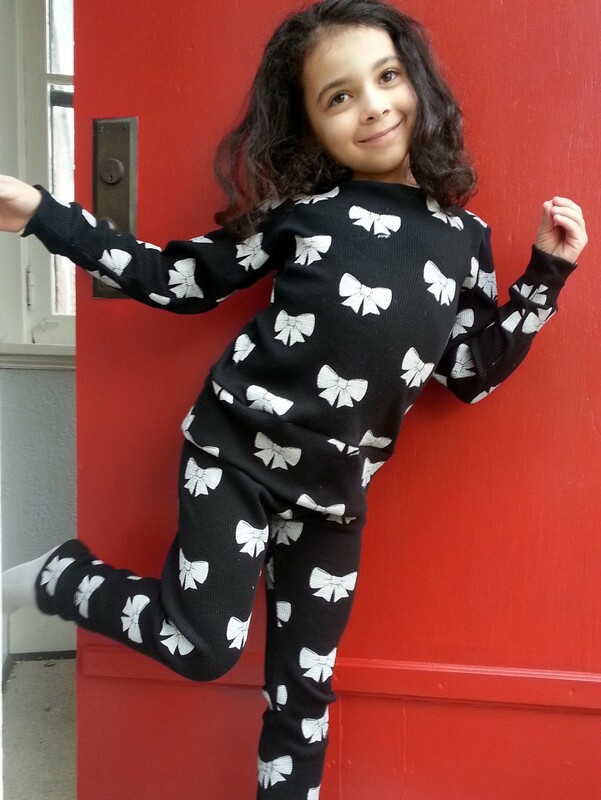 When I came across this black and white bow print waffle knit at (of course) Girl Charlee I jumped on it and bought a few yards. You can’t go wrong with the price! You can find it here. I don’t think I would sew with this particular fabric again though- I think the bow print gummed up my sewing machine- the serger kept skipping stitches and my sewing machine broke a needle! Not sure if it was just a bad day for me or if it it was the “paint” used to make the bows (they are a bit raised and imprinted on). Either way I was so frustrated and they took MUCH longer to make than they should have- but I finished them! Seeing how much Isabel loved them totally made it worth it! I self drafted a pattern for the top using the same construction as my Skater dress pattern (but added a banded bottom), and the pants are made from my Go To leggings pattern. I swear I can take better pictures than these…yikes. A cell phone pic of a wiggly kid on a dark and rainy evening is not ideal, but you get the idea! A big reveal next week on this blog will show you what I have been super busy working on, hopefully will provide better conditions for sewing and photos. Until then, finding time to sew for this challenge on top of everything else isn’t leaving much time for pictures. Oh well. Easy peasy no pattern needed, cozy, warm and simple legwarmers. Perfect accessory for this cool weather. When did it become fall? Wasn’t it in the 70’s just a few days ago, or so it feels. It is in the 40’s today, we have our heat on, and no matter how much I love Fall it hits me hard when the temps drop. Brrrr. 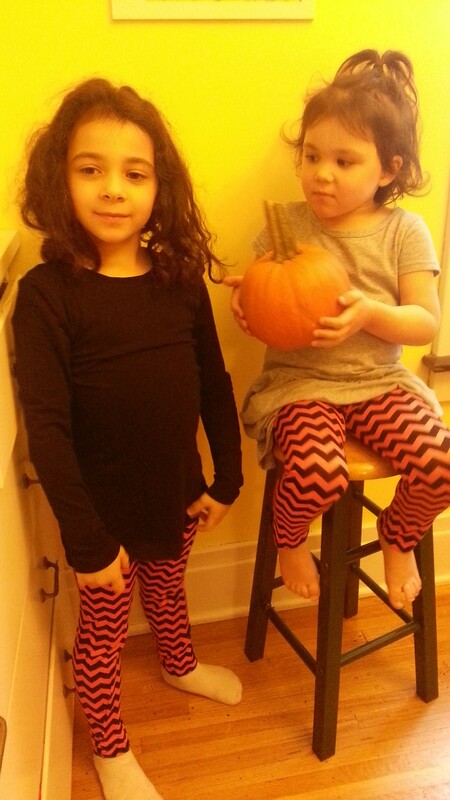 We have been walking to ballet without jackets on, with the girls in their leotards. Now it is freezing out! I whipped these up in about 20 minutes, just in time for ballet today! 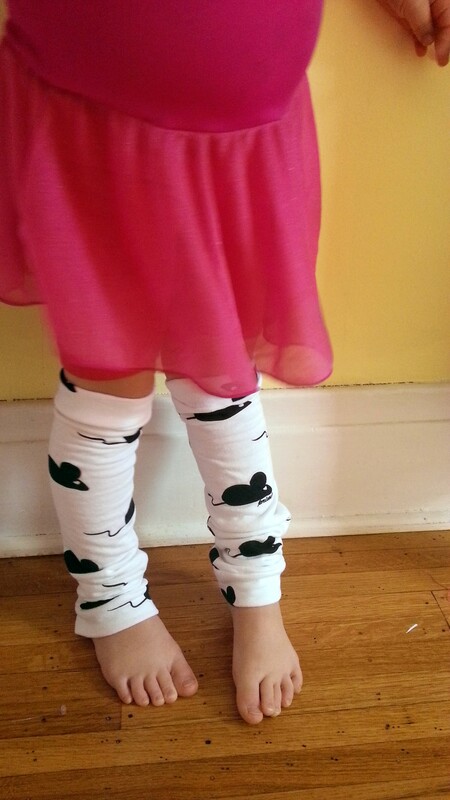 The fabric is a white/black mouse print from girl charlee. It is Heart Mouse on white cotton jersey sweatshirt knit…totally soft and fuzzy inside, but not much stretch. I am going strong with this 1/4 yard surprise bargain lot I ordered from there a few weeks ago…so exciting to try out fabrics I wouldn’t normally buy yardage of. If I could only keep Eleanor still for a moment to snap a picture! I simply cut (2) 9inch by 14 inch (length of my fabric) pieces for the legwarmer, and (4) 9 inch by 7 inch pieces for the cuffs. I serged up the seam on the length of my large pieces. Then serge the ends of the small cuff pieces together, fold them to form the cuff and serge them onto the tops and bottoms of the legwarmers. Simple. The girls may be getting a number of these…perfect to use up small pieces of knit fabric I have lying around, and great for keeping those little legs warm at ballet or the bus stop! 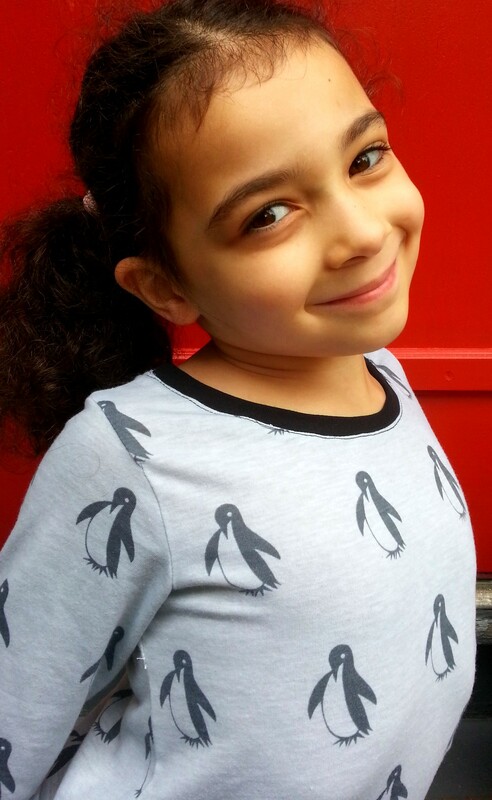 Wasn’t it just yesterday that I was posting for the Summer Kids Clothes Week? How am I not prepared for this? I just happened to come across another blogs post about today being the first day of KCW and I was like WHAT? This is the one challenge that keeps me going and sewing clothes for the girls…I had so much fun doing it this summer and can’t believe I didn’t keep track of when the fall challenge begins. OOPS. Well, it isn’t too late- I whipped up something tonight! 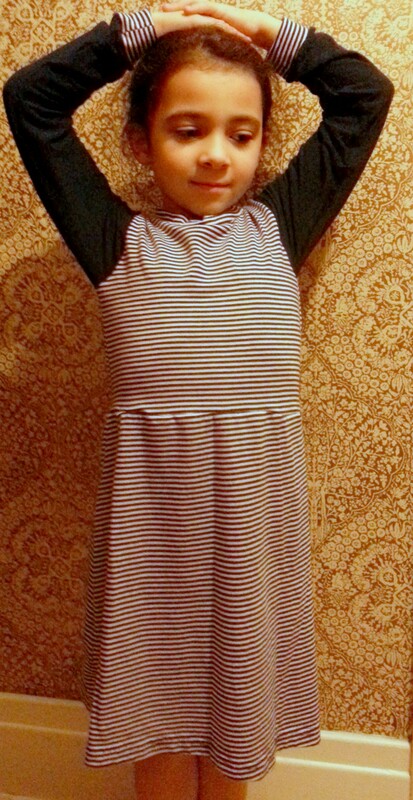 What did I sew with an hour before bedtime and the goal of having one of the girls model the item/take pictures/ and blog before bed? Thankfully I had a Skater dress (yes, another one!) already cut and put to the side in my pile of things that I never get to and I was able to sew it up so quickly. Phew. Getting a decent picture of it in the dark is clearly impossible but I did my best. 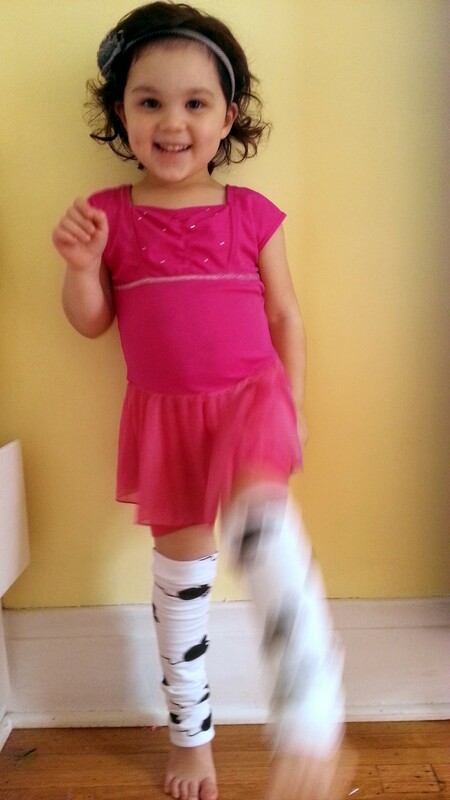 Thankfully, Isabel was agreeable and put it on, posed, and went to bed. Not too bad! The sleeves are a navy jersey knit from a Girl Charlee 1/4 yard surprise bundle I bought a few weeks ago and the main body is actually a navy/white striped men’s t-shirt I picked up for $1 at the Salvation Army- woo hoo. My favorite part is the contrast sleeve cuffs- so cute. 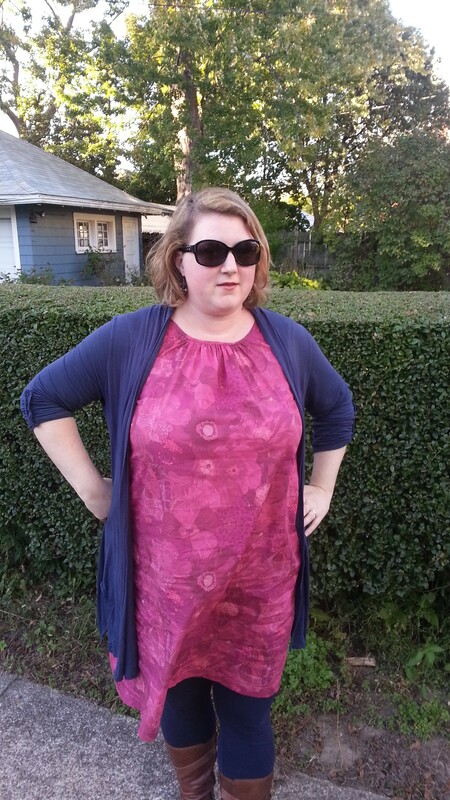 I even used the bottom hem of the shirt to hem the dress=much less work. I have found hemming knits to be my least favorite thing so this saved me the time and stress. Love it. I promise not to make another skater dress this week even though I am already behind, no planning, no cutting, no shopping done but I still think I can whip something up each day to keep my participation in this challenge strong. 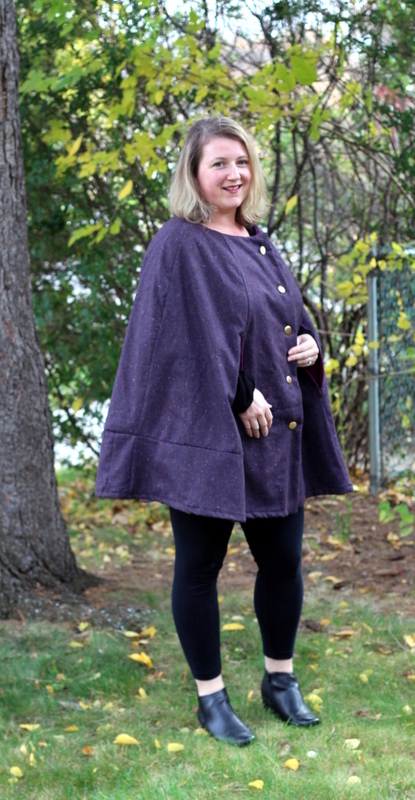 I am thinking easy comfy, wearable projects like leggings, legwarmers and pajamas. We’ll see how much I accomplish. I am in the middle of painting my sewing room, and I am temporarily sewing in my husband’s office-not the best. I will be busy finishing the painting, putting together my new sewing room furniture and celebrating my birthday this week (on top of all of the normal work/kids/school stuff). Yikes. Fabric splurge! 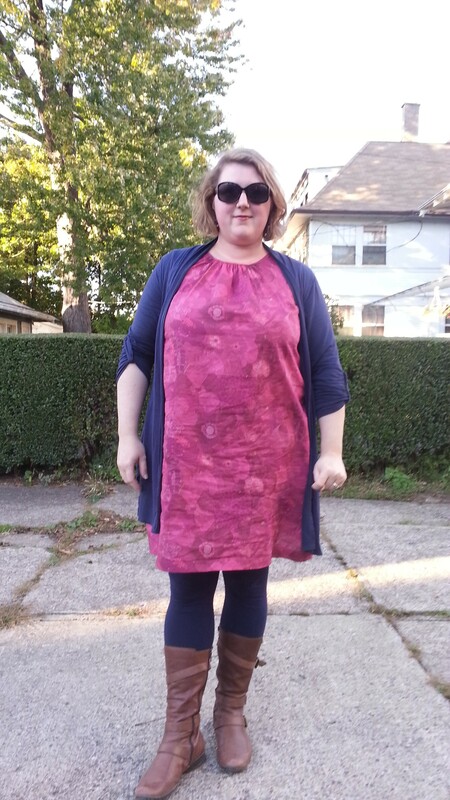 My (first) Liberty of London dress. It’s a match made in heaven. Ever since I picked up my copy of Stylish Dress book I have been dying to make one with a Liberty print. So many of the beautiful prints in the book are Liberty, and much of my online inspiration has been those made out of Liberty as well. Case in point- the makesomething blog. Really? 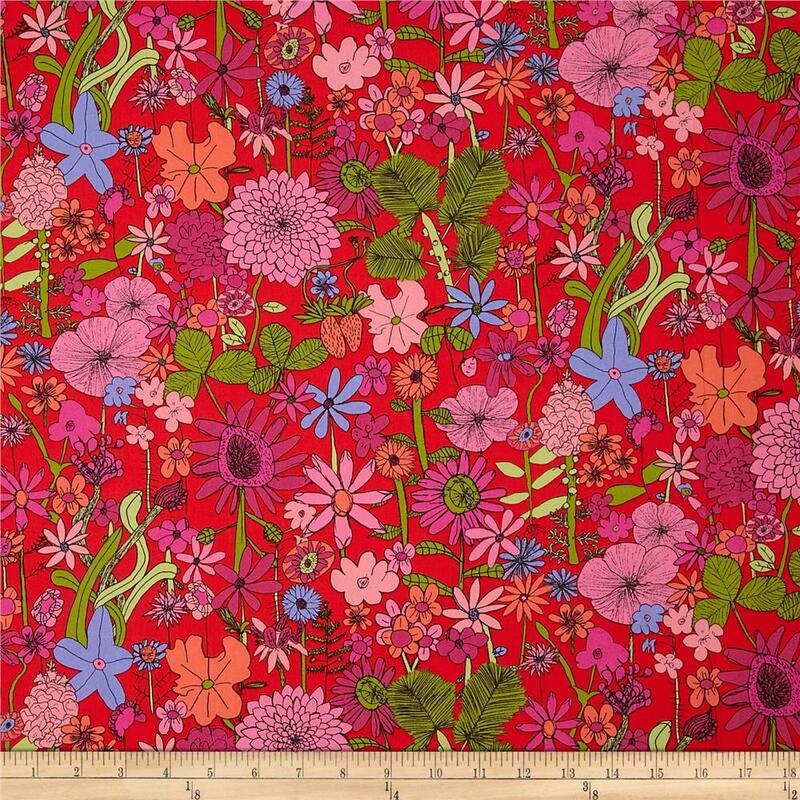 When I first googled this book to look for inspiration I found this blog and was in awe of how many amazing garments she has made with Liberty of London fabrics. I immediately felt cheap (or poor!) when I added up the cost of the fabric and the amount of it needed to make a dress- WOW. Much more money than I ordinarily spend on anything for myself at the store. Anyways, fast forward a few months and I finally became brave enough to cut into said fabric and make myself my dress. 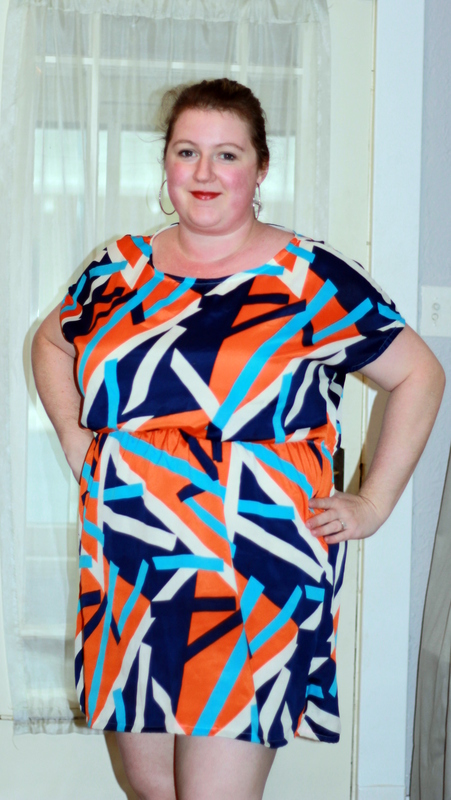 I chose to repeat a dress I have made a few times already- I didn’t want to risk this fabric on a pattern I hadn’t tested out yet…so I chose Style A from Stylish Dress book. 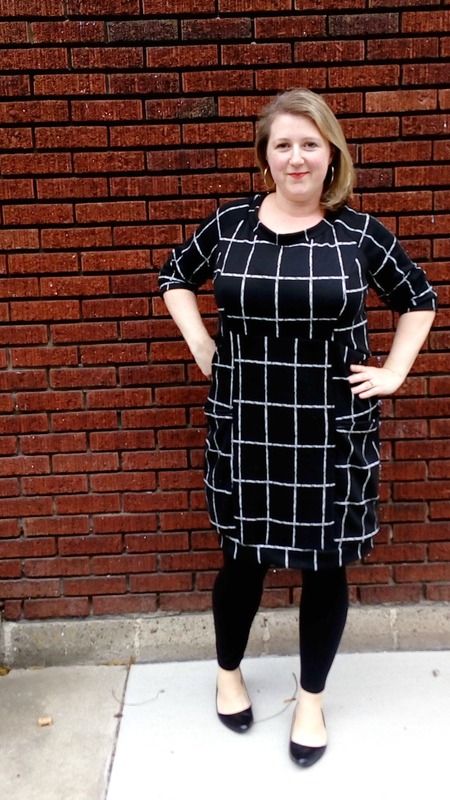 A simple sleeveless dress with matching bias trim and a gathered neckline and bust darts. Pretty happy with how it turned out! I followed the pattern exactly, only thing I wish I had adjusted are the bust darts…being more “endowed” than the model (obviously) I really need to lower them- but too late…I will have to work with it as is. Beautiful fabric, simple pattern and very versatile. Wish I had whipped this up earlier so that I could have worn it over the summer, but nothing leggings and a cardigan can’t fix! I really have a hard time getting a decent picture of myself, I do not like having my picture taken and feel especially awkward posing on purpose for this blog. 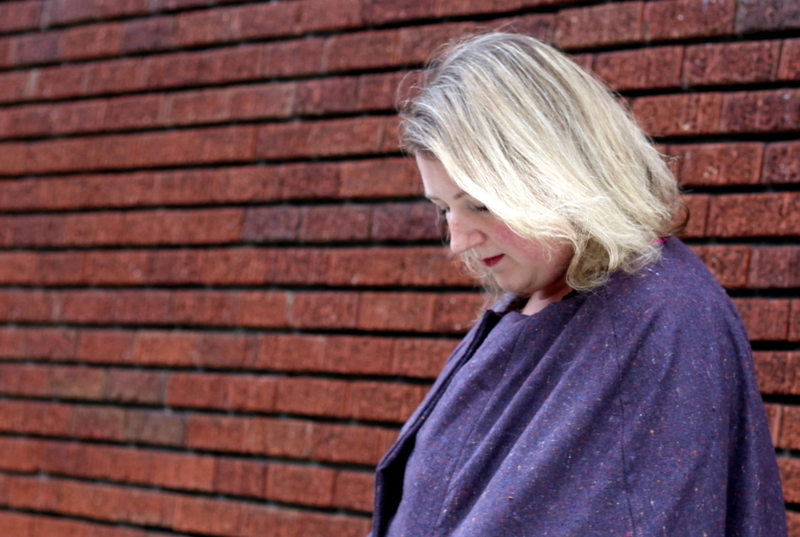 Apparently I can’t even keep a straight face when I ask my husband to take my picture (doesn’t help that he finds this blog incredibly strange). What am I doing here- posing like a superhero, while laughing? It is actually a bit better when I ask Isabel to take my picture- the perspective from the height of a six year old is a bit more flattering. ha ha. Oh well, not the best shots but the dress is done, it is comfortable and wearable. 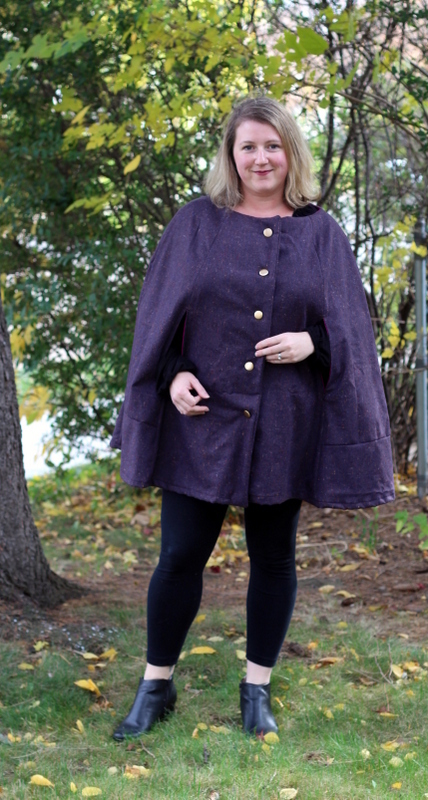 These shots were taken after a long day spent at a fall festival so ignore the wrinkles! 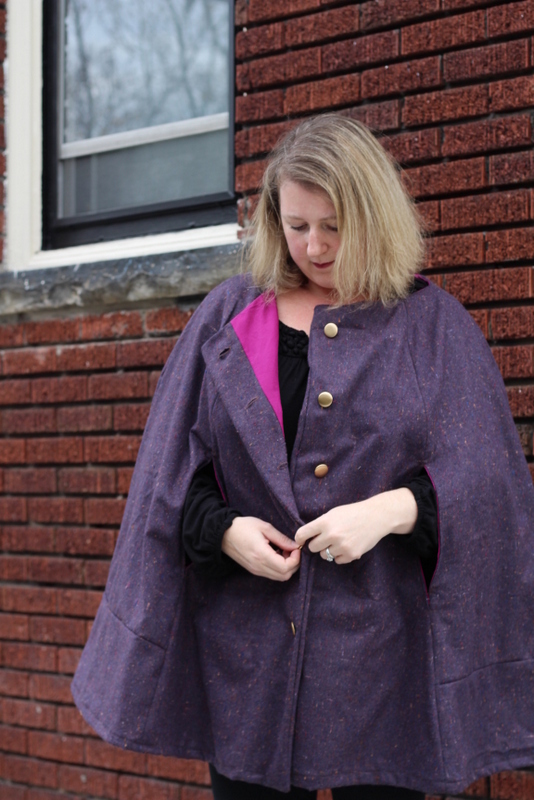 *well, shopping online can be dangerous as well…especially since fabric.com sells Liberty too! This print might be calling my name pretty soon. I sewed this up a while ago, but haven’t found time to take pictures until now. Eleanor has now decided she does not like this dress, and was putting up a big stink about even trying it on for a picture…so stubborn! She finally gave in and let me take a few shots, not the best but they show how totally cute this dress is! Even if she doesn’t like it today I hope she changes her mind. 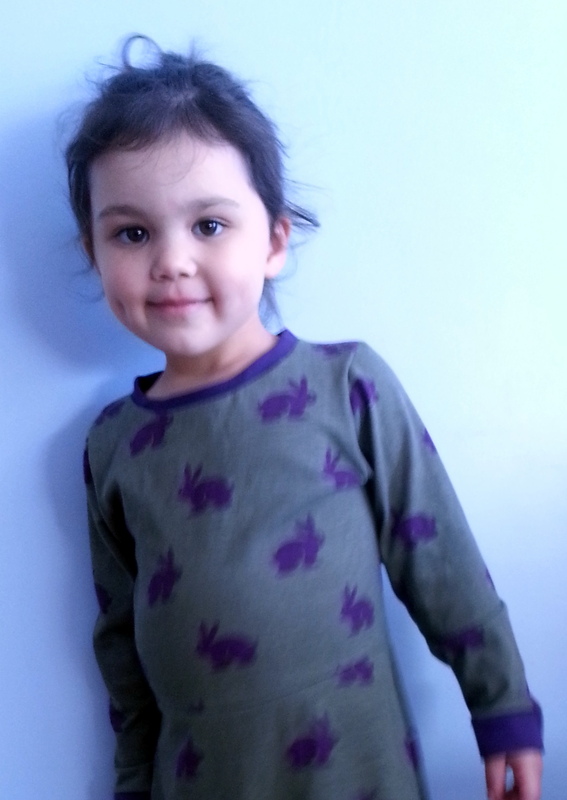 I even made her a pair of matching purple leggings, but didn’t want to push it to make her put them on. It would have probably put her over the edge! 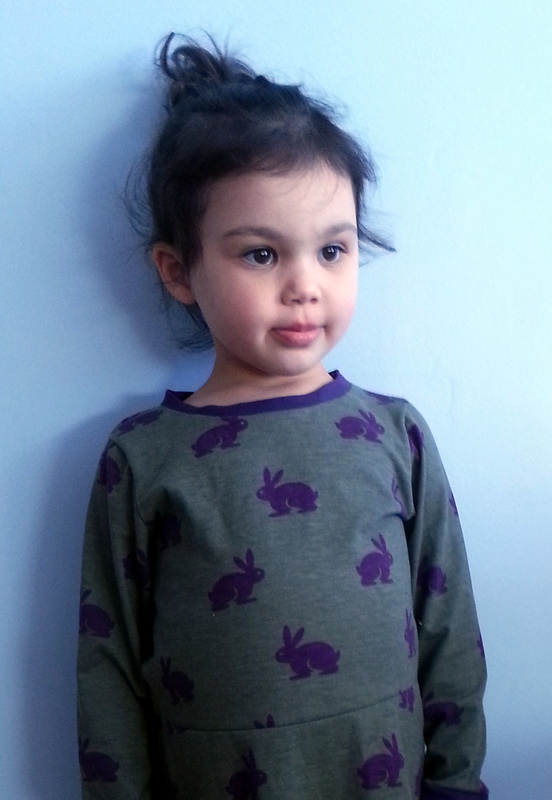 The main fabric is Bunny Rabbit Silhouette on Lichen Green Cotton Jersey Blend Knit Fabric from Girl Charlee. Such a sweet print. Love the purple bunnies! I knew I wanted to match the purple for the trim and cuffs but didn’t want to run to the fabric store to try and find a matching jersey so I headed to the Salvation Army. Although I am loyal to my Amvets, I ventured out after I heard from a friend they have Family day at Salvation Army on Wednesdays- and I scored a dark purple polo shirt for only $1!! 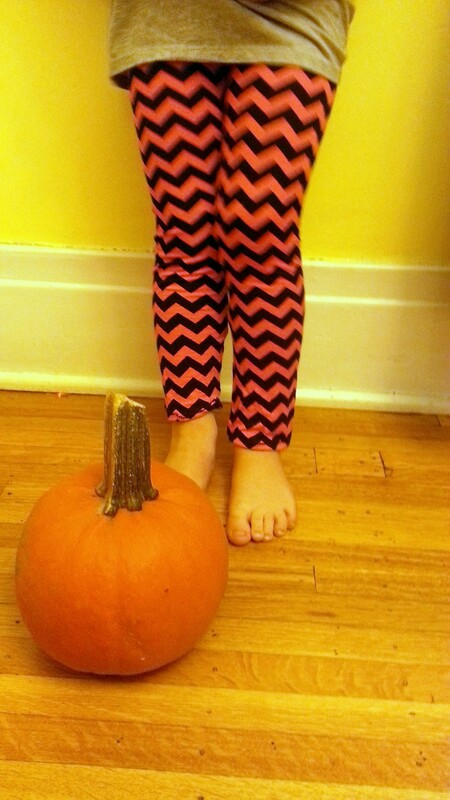 I was able to use it for the trim, cuffs AND the matching leggings. Sweet. 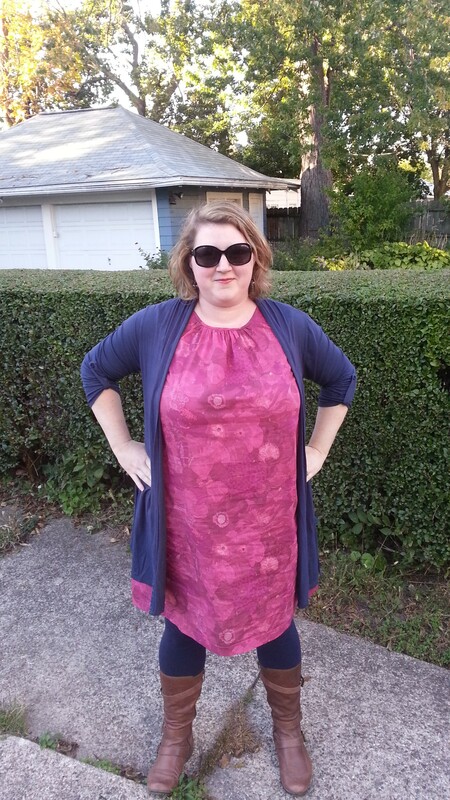 The pattern is of course the Skater Dress that I have blogged about over and over already, again in long sleeves. This is the first dress that is completely serged, I did not use my sewing machine at all-wow. Now that I have made a number of these they go so fast, I swear it takes longer to cut the pattern out than it does to sew it together. I have a few more coming up as well, I went a bit overboard and ordered more knit fabric from Girl Charlee…including a very exciting knit dress for MYSELF! I had to include a shot up close to show the true color and print. 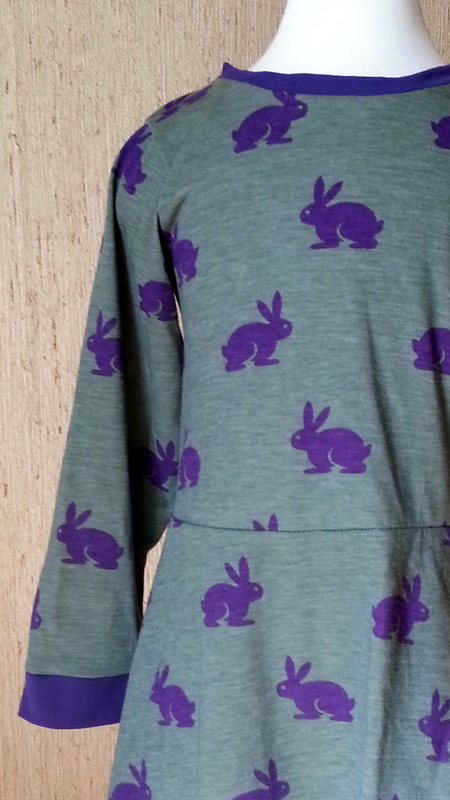 The dark purple bunnies really pop out on the greenish background. Perhaps I should just stick to taking pictures on the dress form? So much easier to get a good shot when it is not on a squirmy little kid! Penguins. Soft knit fabric. Long sleeves. Tried and true sewing pattern (blogged about here and here). 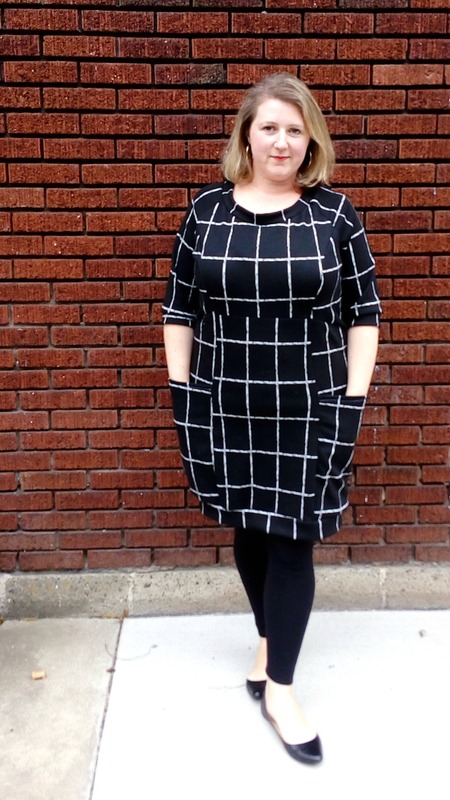 Add all of it up and you get a simple, warm and comfortable dress for fall. 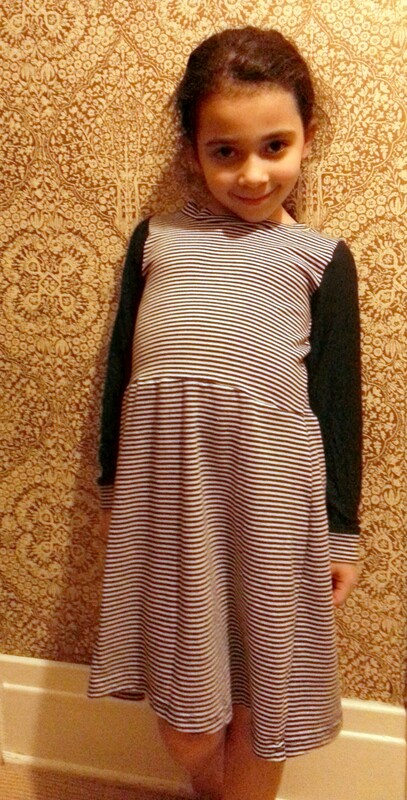 My girls favorite dresses are for sure their long sleeved Skater dresses I made last year (before blogging!). I have FINALLY gotten around to making another long sleeve version of this but now that it is officially Fall I figured it was time. 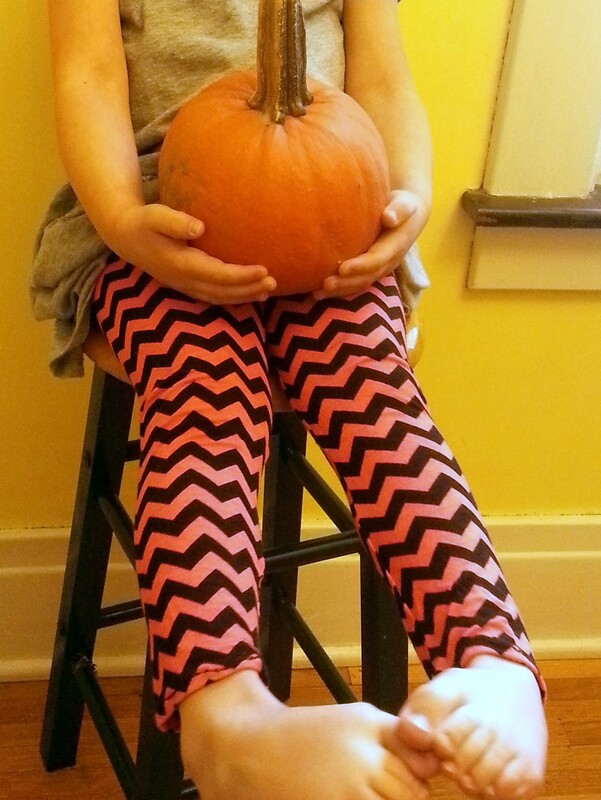 I picked out this adorable knit fabric from my favorite online source- Girl Charlee. 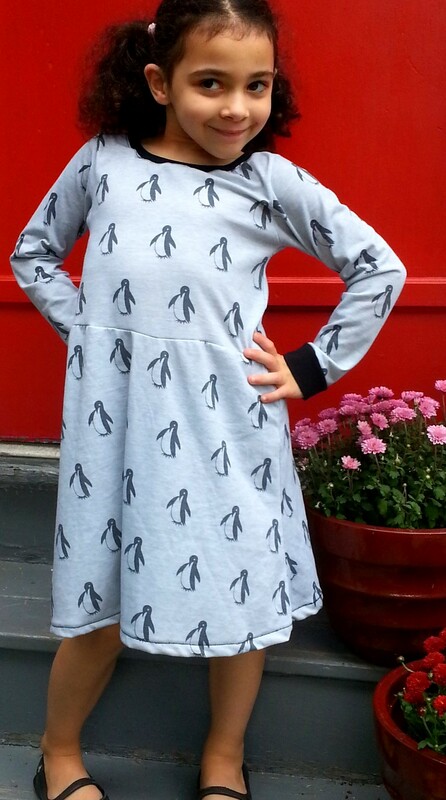 It is a sweet graphic Penguin allover print on a soft grey background. 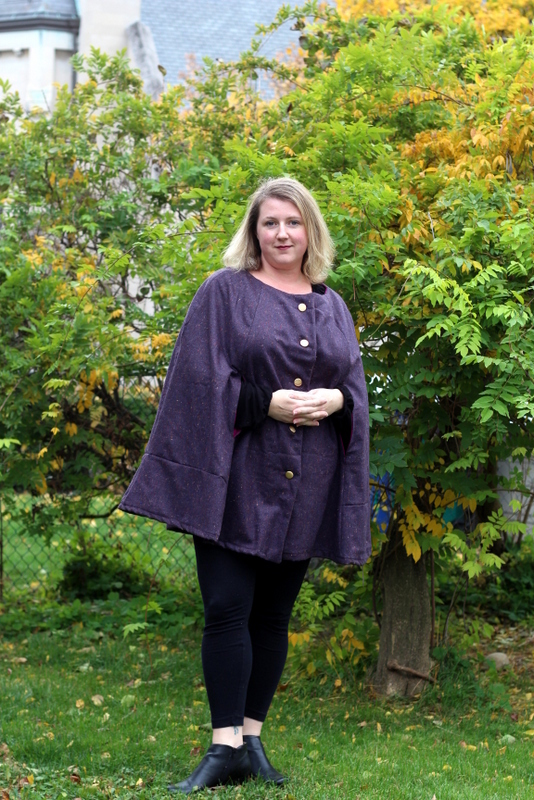 I had planned to use the same fabric for the neckline and cuffs, but after sewing the neckline found it wouldn’t work. 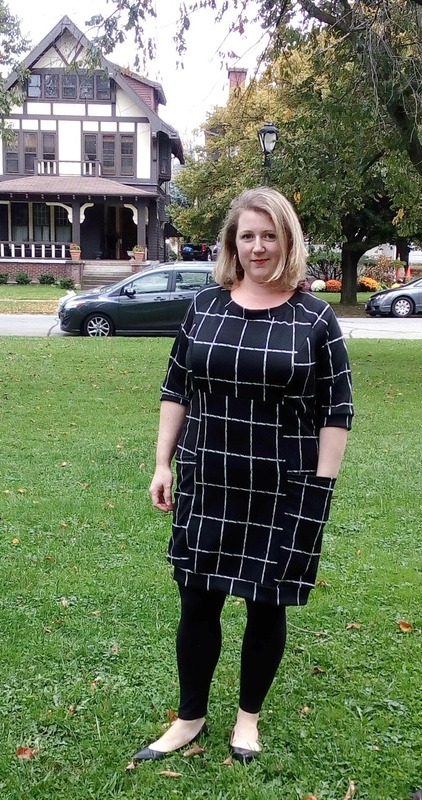 I should have stuck to the pattern directions from the beginning and used a ribbed knit, but this is the first time making this dress that my fabric didn’t work- I have found this particular fabric to be much thinner and with much less stretch than other knits I have bought. I love the print, but the feel and weight of the fabric isn’t what I had hoped for. 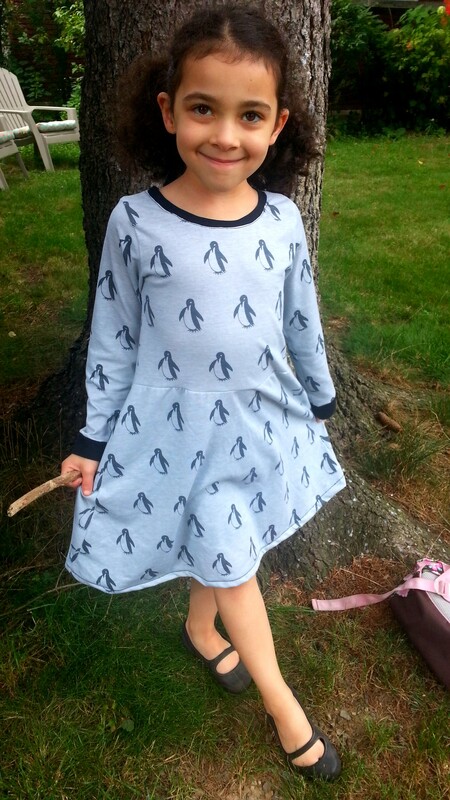 Isabel chose the penguin pattern, but isn’t too fond of the black knit neckline and cuffs. Picky, picky. She said it reminds her of pajamas. Oh well, hopefully she will learn to love it. I think it is pretty cool with the black trim, especially when paired with black leggings (or shorts like today because it is so crazy warm out) I did make this a bit large for her (she seems to have stretched up this summer, is now so much thinner- she is getting big) I guess this just means she will have more time to grow to love it. You can see from her backpack she actually CHOSE to wear it to school today…that is a good sign! 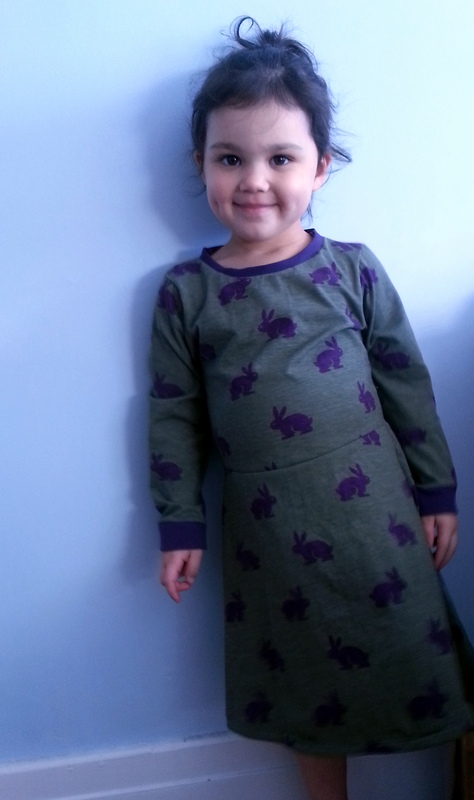 Next up, a coordinating dress for her sister…let’s hope the purple bunnies I chose will grow on her. Sense an animal theme? Girl Charlee has the best knit prints out there…I have an order on it’s way right now that I can’t wait to sew up (feathers!). For me this time! I sense a knit dress in my future. Is there anything easier or more comfortable? So, can you believe this is my 50th blog post! I never thought I’d stick with it this long, but it has been so much fun and a great place for me to keep track of what I have been doing and making. Hope you keep reading for 50 more!